Below are ten common idiomatic expressions, involving words associated with a creature. i) Read through them and choose the missing word from the box. Can you guess what the creature is? 1. There's plenty more ………… in the sea. 2. He's a big ………… in a small pond. 3. We've ………… a big contract in Australia. 4. He's always ………… for compliments. 5. Richard Branson's Virgin has ………… several new companies. 6. I'm ………… I just can't stop. 8. He's ………… for a promotion. 10. There's something ………… going on. Before you move onto the next exercise check your decisions with the answer box. ii) Now try to put the expressions into the situations below. For example: "My girlfriend just told me she doesn't want to see me ever again!" "Don't worry, there are plenty more fish in the sea"
1. Are you still smoking 20 cigarettes a day? 2. She's very attractive, has a well paid job and a big house! Yes ……………..… by anyone's standards. 3. Why are all the managers having those meetings behind closed doors? 4. What do you think of my new jacket? 5. Why are you opening offices in Sydney? 6. Look! John's making the boss a cup of tea again! 7. The high labour costs in Europe have ………………….. a lot of garment factories in Bangladesh. 8. She never laughs, joins in the fun or smiles. She's a ………………………..
9. He rejected a move to the head office, preferring to stay as the branch manager. 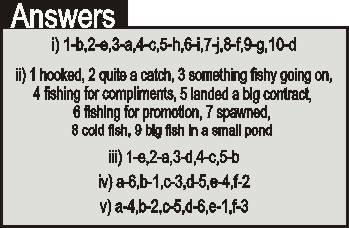 iii) The following idioms mention all these 'fish': Flounder, Minnow, Herring, Whale, Shark. Try to match the idioms with their meanings. iv) Look at the idiomatic expressions in the box. Try to put them into the sentences below. a) The police are looking for a man in his forties who probably has a police record. They are having to ………………… their computer records. b) The job is far too important to advertise just locally. If we want to attract a good candidate we need to ……………….. and advertise nationally. c) He believed me! I told him his company owed me some money and he swallowed it ………………..! d) I know he said something rude about you. Don't ……………….. he just wants to start a fight. e) John made a terrible mistake, but it's the first time he's done anything like this and he is very sorry. I think we should ……………….. this time. f) I keep making far too many spelling mistakes. I need to check them more carefully, there are far too many ………………..
v) In the box there are pairs of words which can make idioms. Identify the missing words and put them into the right sentence below. a) Congratulations! I hear you ……….. the U.N. ………. b) Well I never liked her anyway! There are ………. more fish in the ………. c) I was late for work again! Thankfully so was the boss, so he ………. me off the ………. as long as it doesn't happen again. d) You'll never find a good wife if you just look in this little old town. You should ………. your net a bit ………. e) What a holiday! We had a ………. of a ………. !